This entry was posted in Academic achievements, General News and tagged fellowship, fisheries on October 6, 2011 by Wire Eagle. 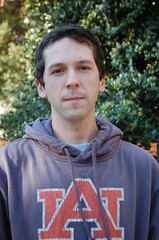 AUBURN – Michael Chislock, a Ph.D. student in Auburn University’s Department of Fisheries and Allied Aquacultures, has been awarded a three-year, $126,000 graduate fellowship from the Environmental Protection Agency to fund his doctoral research on the ecological control of toxic blue-green algae in freshwater ecosystems. The prestigious research award is funded through the EPA’s highly competitive Science to Achieve Results, or STAR, program. Chislock is focusing primarily on the aquaculture industry, where blue-green algae, commonly known as pond scum, can cause fish kills and off-flavor problems that can be financially devastating for producers. But he says that blue-green algae have also been implicated in the poisoning of drinking water supplies, food webs, pets and humans. In his doctoral studies, Chislock will work to determine whether microscopic aquatic herbivorous zooplankton called Daphnia can adapt to harmful blue-green algae in nutrient-rich ponds, rivers, lakes and wetlands and ultimately be used to consume and thus control the toxic cyanobacterial blooms in freshwater ecosystems. Chislock began the research during his studies for his master’s degree in fisheries, received recently under the direction of fisheries and allied aquacultures assistant professor Alan Wilson. Chislock holds a bachelor’s degree in biology from Clarion University in his native Pennsylvania. In May, he was recognized as one of Auburn University’s 10 most outstanding master’s students and during the summer worked as a graduate student mentor in the National Science Foundation-funded Research Experiences for Undergraduates warm-water aquatic ecology program led by Wilson. With his latest honor, Chislock follows in his major professor’s footsteps. Wilson received a three-year STAR graduate fellowship in 2003 as a Ph.D. student at Georgia Institute of Technology for his research related to blue-green algae.